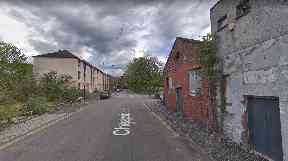 Police found more than 2000 cannabis plants during search of property in Glasgow. Cannabis plants worth around £1.4m have been seized by police in Glasgow. Officers were called to a building on Cheapside Street, Anderston, on Monday following a tip-off from a member of the public. Acting under warrant, the officers searched a building and discovered over 2300 cannabis plants inside. An investigation has now been launched and police are appealing for anyone with information on the plants to come forward. Detective inspector Davy Hill said: "We reacted to a call regarding this property and as a result discovered a large scale cannabis cultivation site, one of the biggest in the west of Scotland. "A substantial amount of cannabis plants will now be taken out of our community and will significantly impact those involved in drug dealing. "Criminal activity such as this will not be taken lightly and we will continue to carry out enquiries to find those responsible for this site, and anybody else linked to the growing and distribution of drugs. "We encourage anyone with any information to come forward and contact us. You can be reassured that we will act on any information we receive."